Once thought of as the end of the earth, this land is indeed remote and extreme – only accessible to tourists via a chartered scenic flight or an expedition cruise. A visit to Antarctica has been on my bucket list for many years. When I suddenly found myself with an opportunity to view this land from the air, I jumped at the chance. So with my new Nikon camera in tow we departed Brisbane for Adelaide. 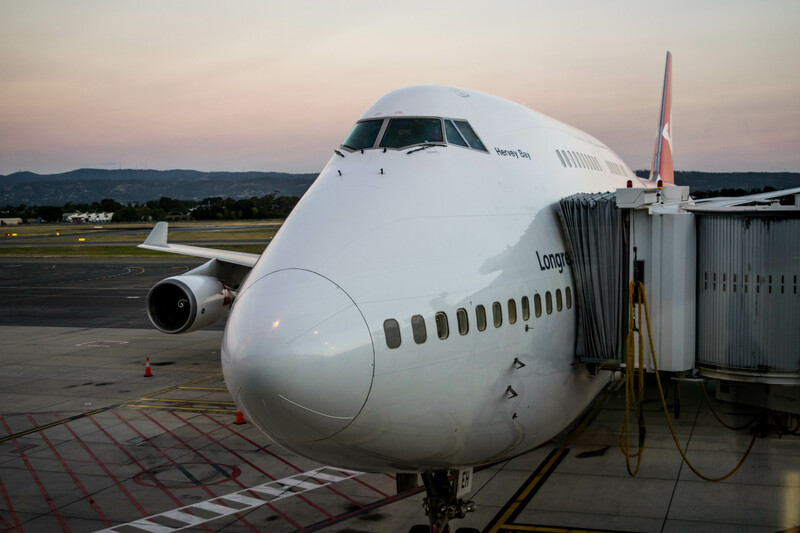 Our chartered Qantas 747-400ER was awaiting in the early morning light for her precious cargo. Anyone who knows us, understands that we have a love for aviation and I was actually asked, on more than one occasion, which was I more excited for? 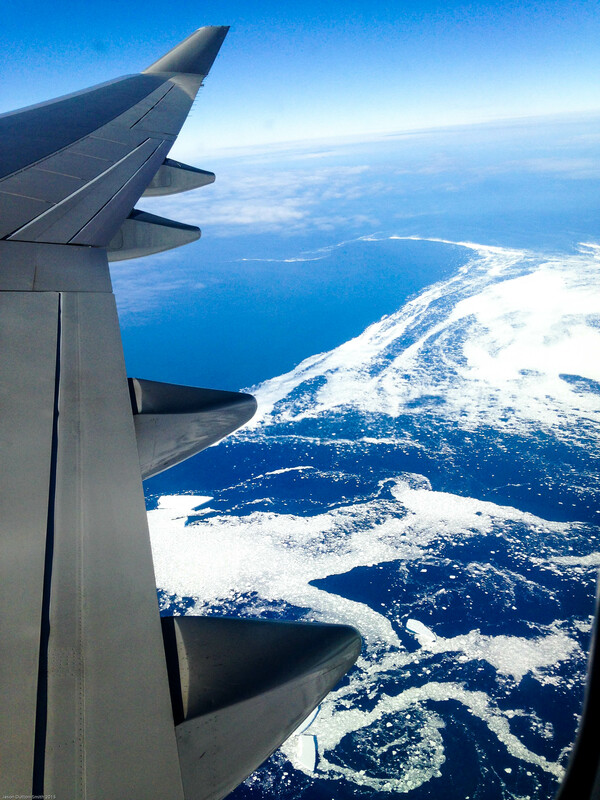 The 747 flight or the Antarctic experience? And yes, I had to think about my answer! We arrived early at the departure gate where our fellow passengers were checking-in. 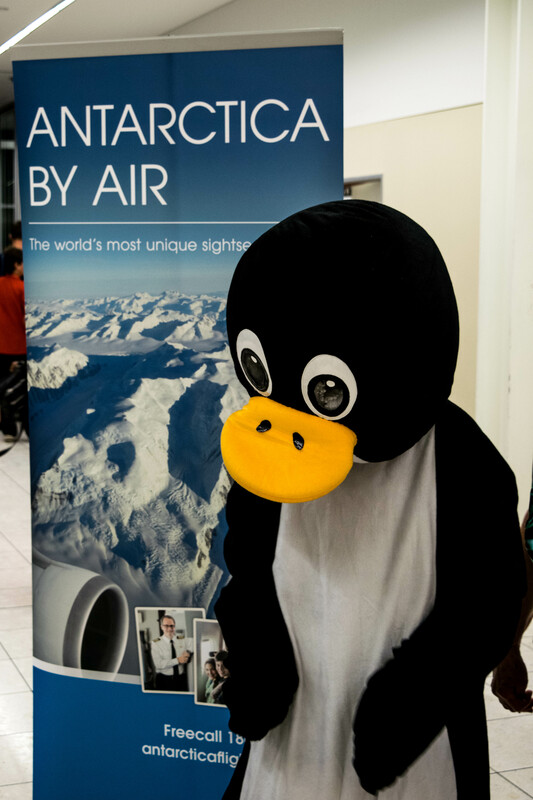 Greeted by an over-sized penguin and friendly staff from Antarctica Flights, we gathered our boarding passes and headed to the departure gate. In the boarding area were two film crews reporting on the day’s events which added to the atmosphere. Our scheduled departure was 0630 with an estimated arrival time back into Adelaide of 1900. This was going to be a long day but no one seemed to mind this fact. Our big bird; the mighty Qantas Boeing 747-400 on arrival back to Adelaide. Antarctica penguin in the boarding area welcoming all guests. With everyone safely on board, a palpable buzz filled the cabin. We were all giddy with excitement and anxious to begin the adventure that lay before us. I was almost sure on take-off a spontaneous outbreak of applause was going to erupt. 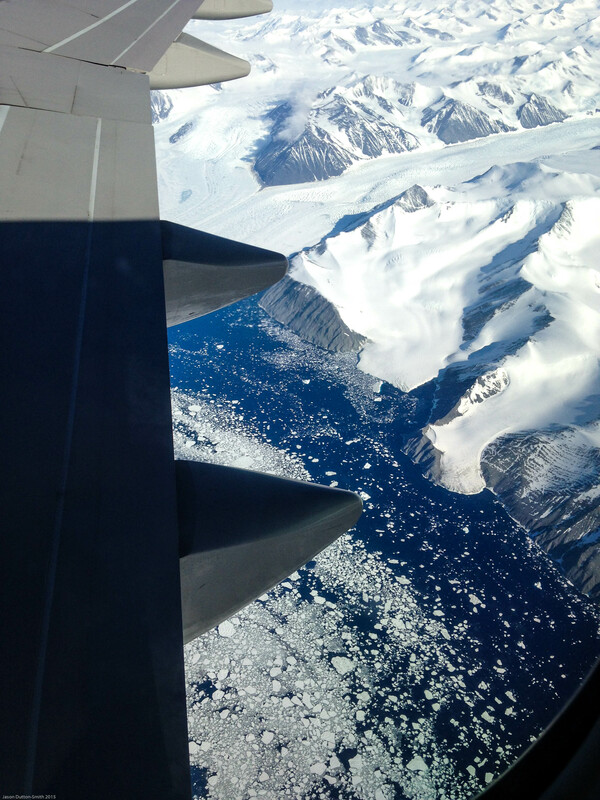 Onboard Qantas 747 charter flight Adelaide to Antarctica. 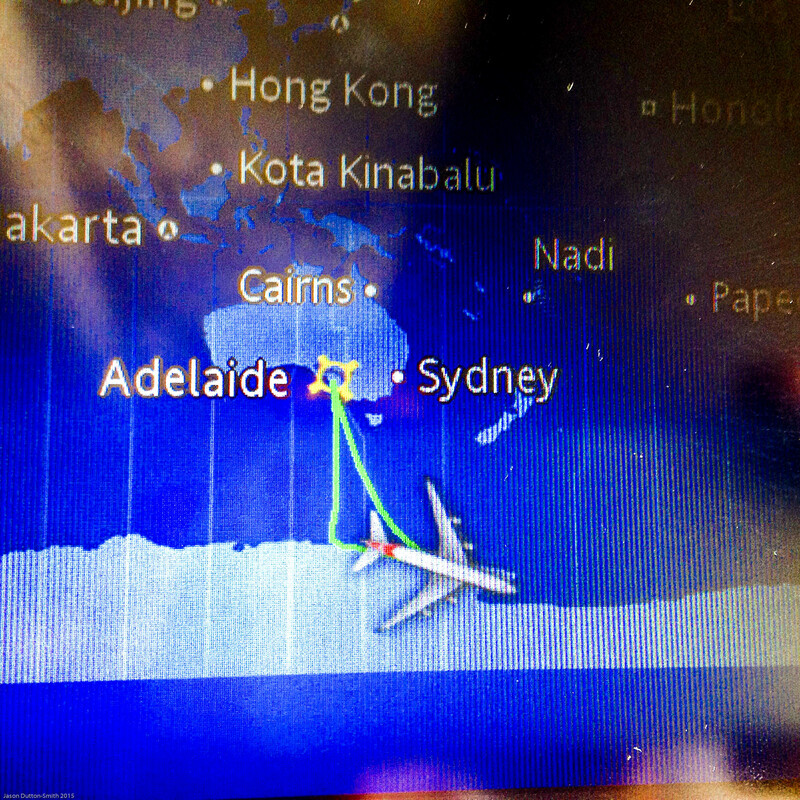 Our flight route out of Adelaide had us heading directly south towards the South Magnetic Pole. Most people, understandably, think the magnetic pole is in the middle of Antarctica. To our surprise the pole is actually located 250km off shore, in the ocean. Past the pole we tracked towards the French base of Dumont Dúrville; so called after the famous explorer of the same name. From here the flight continued east, past Commonwealth Bay to Cape Adare and passing many mountains, lakes, inlets and icebergs below. After four and half hours of some beautiful low level flying and lots of sharp banks for maximum viewing pleasure, it was time to head back to Adelaide. Our total flight time was 13 hours and 10 minutes. This route map shows our exact flight route. 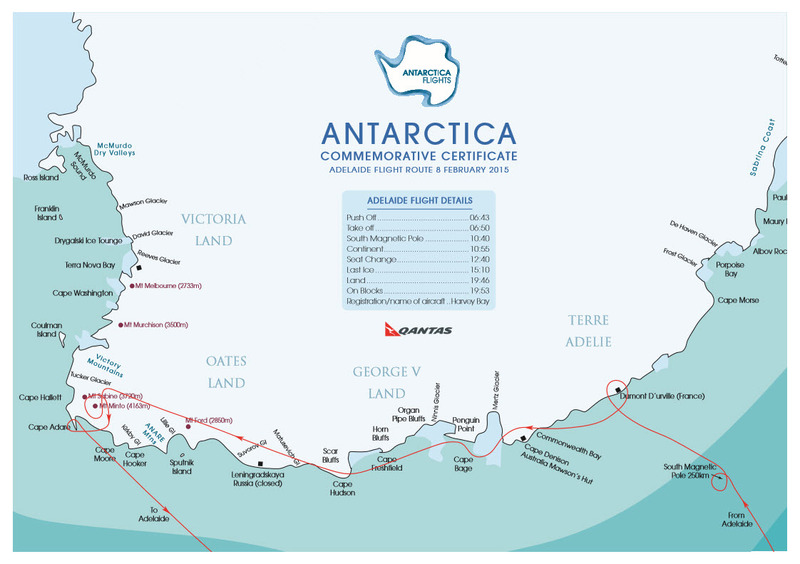 Adelaide to Antarctica flight route map. 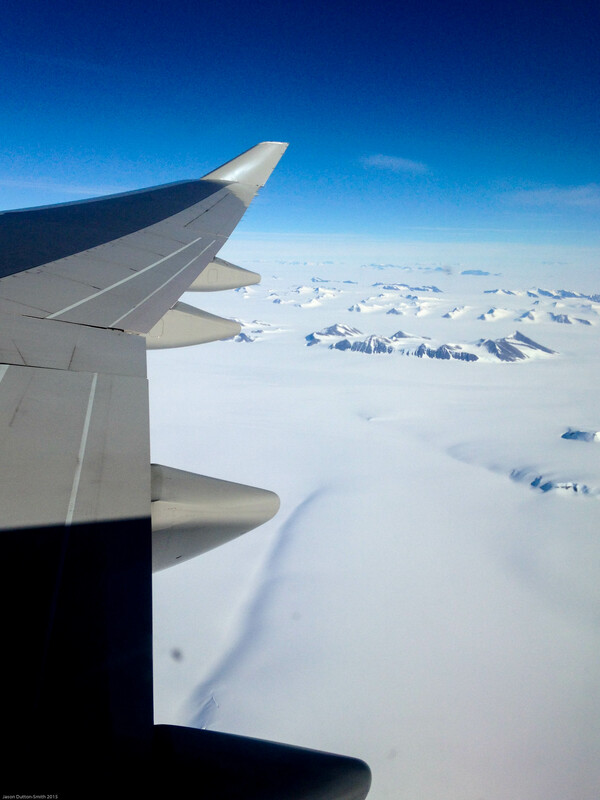 Our Antarctica flight route was direct south from Adelaide with 4.5 hours over the ice continent. 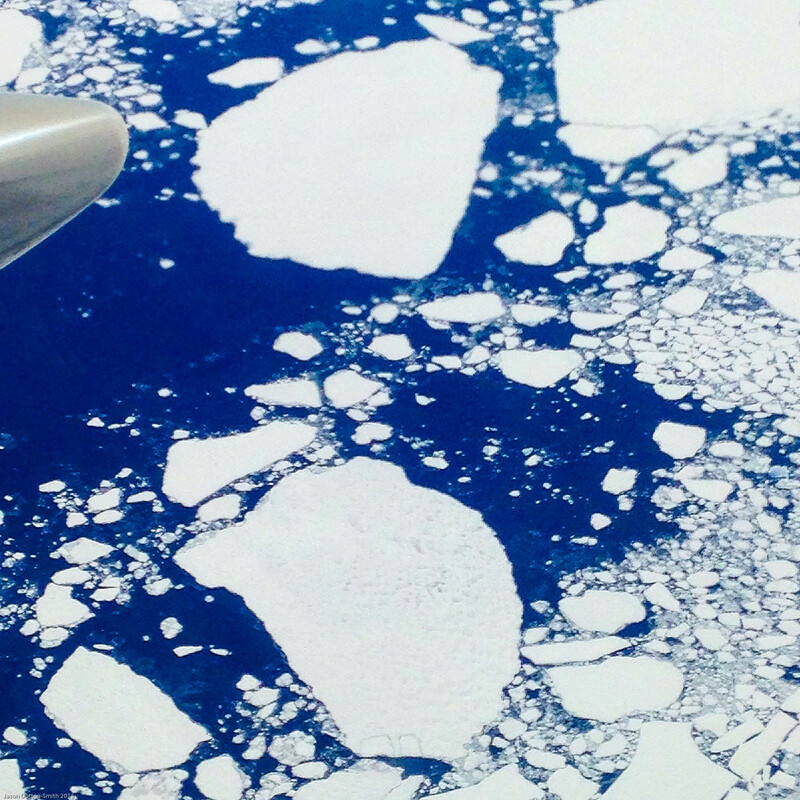 Throughout the flight two Antarctic scientists were aboard providing expert commentary. 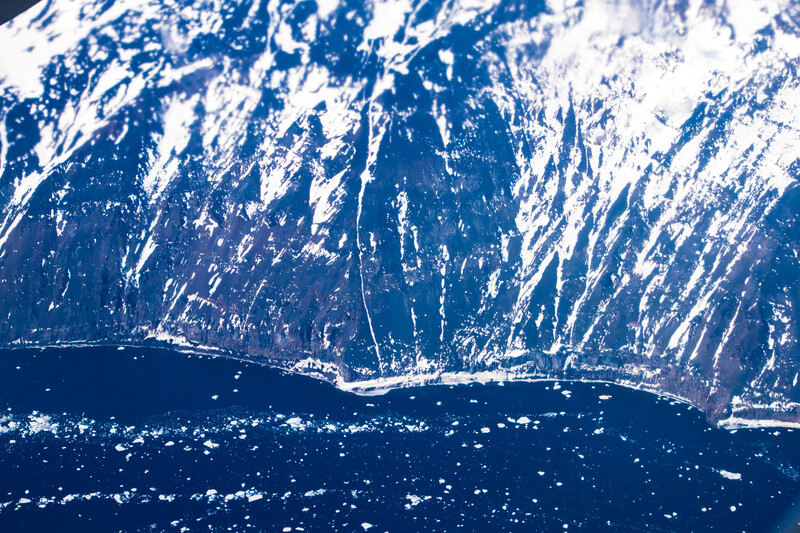 While over the ice, commentary was given from the cockpit pointing out particular land marks and sightings. Another scientist was located in the cabin fielding questions from passengers. Shortly after we broke land a live-to-air interview between aircraft and ground commenced where we heard from Casey Station communications officer Narelle, who explained to us the conditions on the ground. Part of her duties include clearing air space for aircraft and ensure safe passage for all travellers on land, sea and air. “It’s currently a bright summer’s day and -3.6 degrees on land which is considered mild” explained Narelle. “Fairly strong winds today but we do have sunlight all summer long. By end of February we will start to see a small sunrise. But winter will see it dark 24 hours. The Base has up to 120 people at a time during its peak from many nations but this drops to around 22 people during winter months which tend to be harsh. What do we do for fun though? We have a small cinema and library to keep us busy. Outdoor activities include skiing, walking and iceberg cruises plus penguin colony spotting. As Narelle spoke we flew over Casey Station where she could easily spot the aircraft from our low altitude. With a tip of the wings solute we steered back onto the scheduled flight path. Two meals were served during the flight along with snacks in-between. The bar service included complimentary wine and champagne. Shortly after take-off we enjoyed a breakfast with a hot meal or continental choice. I chose the continental option which was a platter of fresh fruit, Greek yogurt with muesli, small muffin, orange juice and hot tea. 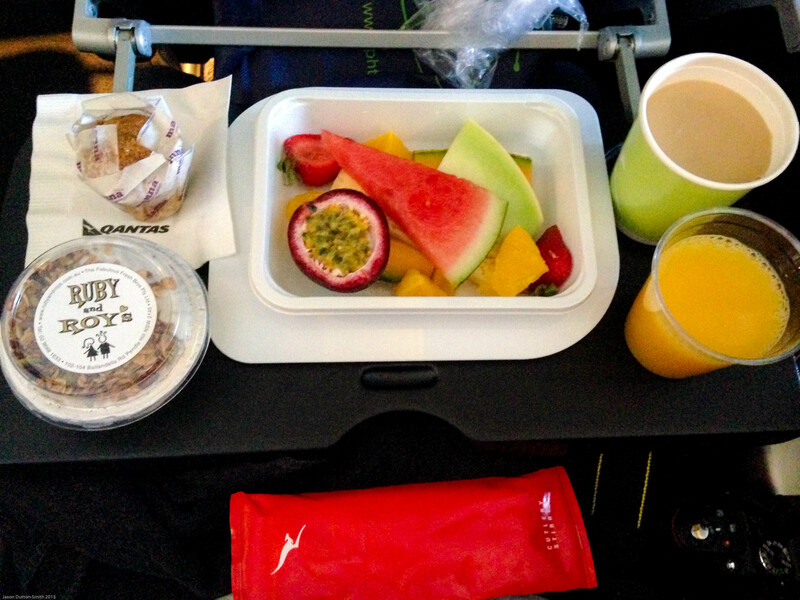 Breakfast onboard Qantas 747-400 Adelaide to Antarctica. Mid-flight snacks included slices of hot pizza, fresh apples, cheese and crackers, bite size muesli bars and drinks of your choice. I’m not sure if this is a regular snack available on scheduled flights or if it was an offering for our charter flight only, but it was a nice touch. 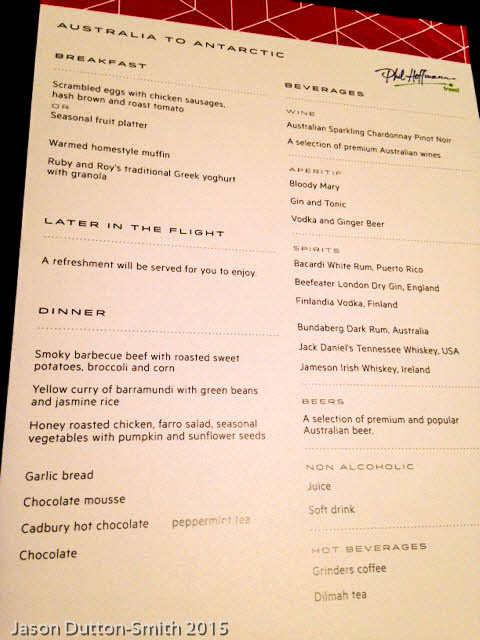 The return flight was a dinner service with a choice of two meals. I selected the honey roasted chicken salad served with garlic bread and a chocolate mousse. The meal was accompanied by a beverage of choice. After dinner we were offered tea, coffee, peppermint tea or hot chocolate which was an enjoyable way to finish the meal. 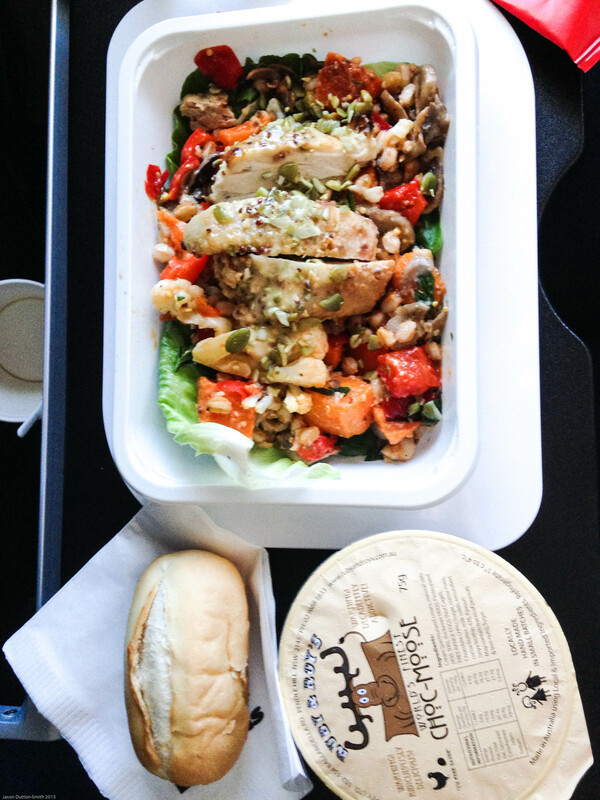 Qantas international meals – today’s dinner was honey roasted chicken salad. The meals on board are part of the new Qantas international economy menu which boasts 25% larger meals. While the meals were a larger portion, and very tasty and well presented for airline food, the traditional side salad and cheese and crackers served on the tray were nowhere to be found. We were seated in economy and initially surprised that every seat was sold. This included all the middle seats of the grand 747. There is a unique seat rotation that takes place half way through the flight. Aisle seats move to the window and adjacent middle seat for viewing on the last half of the sightseeing tour. The lowest priced seats in the middle of the middle section do not rotate. The economy cabin layout on the 747 is 3x4x3. For our flight to Antarctica we started with the two aisle seats. At the half way point we were all asked to rotate (except the middle seats) so we now had the window and middle seat next to the window for remainder of the flight and return to Adelaide. This seemed a fair way to give everyone the opportunity to enjoy window seating. But what about those middle seats? We were told this flight has a unique atmosphere and people mingle throughout the cabin allowing the middle seat ticket holders a chance for optimal viewing. At first I dismissed this as a marketing message, but I was pleasantly surprised at the comradery on board. 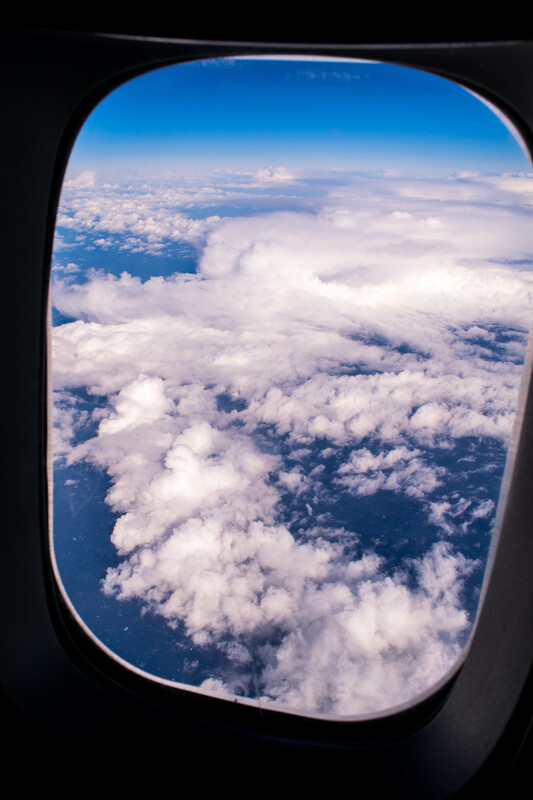 The aisles were filled for most of the flight with mingling people and every window seat person was generous with their space allowing for a fantastic opportunity for all. As it turns out, all seats in economy had great viewing opportunities. The pricing is split between the cabins and priced accordingly. Our flight had the following pricing. I’m asked this question often and my answer is the same each time. 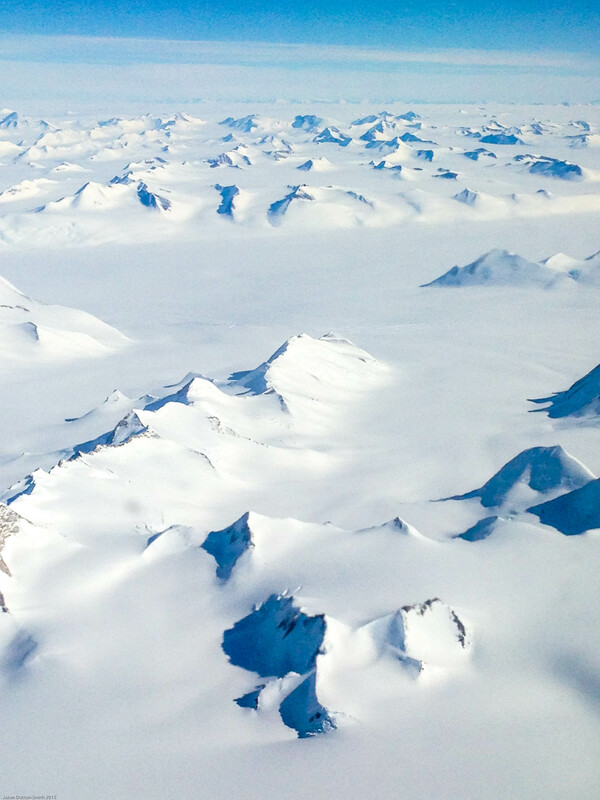 The sheer size and extreme landscapes of Antarctica surprised me. I was expecting a rather flat piece of land stretching as far as the eyes could see. While there was certainly areas like that, there was more mountains, lakes (who thought Antarctica had lakes?! ), inlets and icebergs than I anticipated. Beautiful mountain ranges were far more wide spread then I had initially thought. 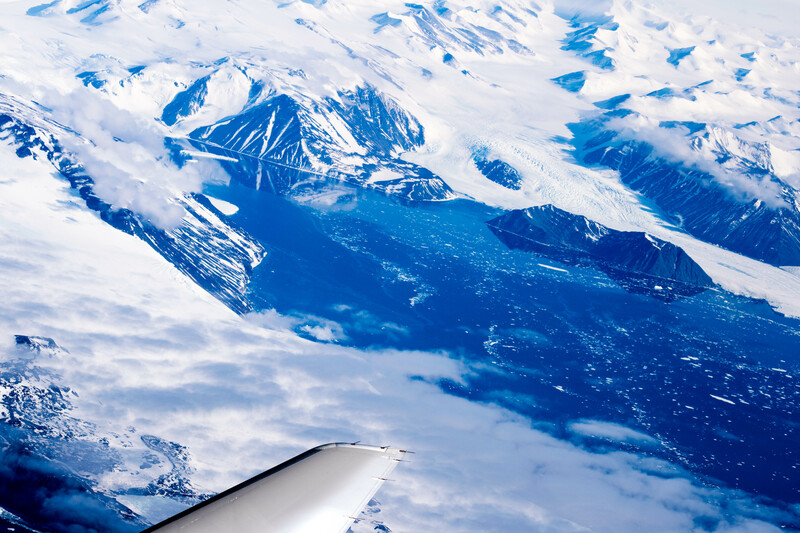 If you have ever wondered about Antarctic flights and if the view is worth it, hopefully these images will help you decide. In my honest opinion, it was absolutely worth it. So much so that I’m now planning an Antarctic cruise! 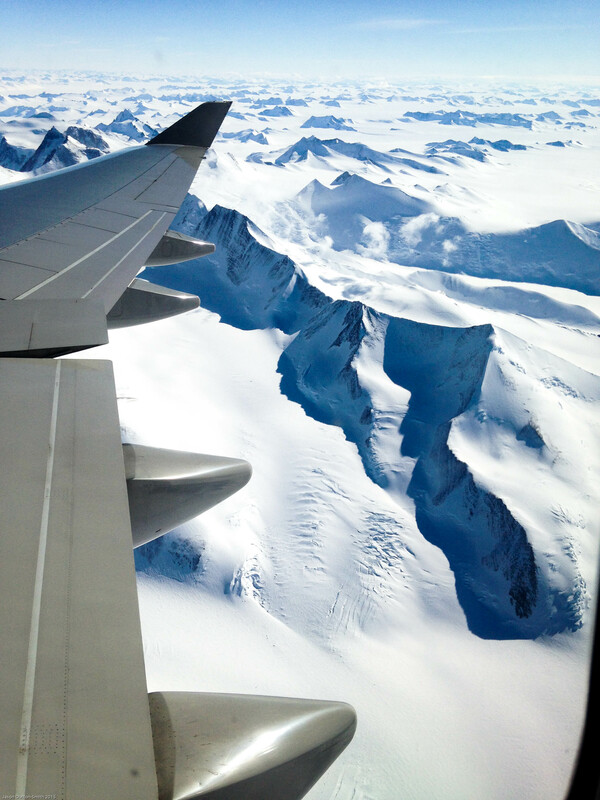 From the back window heading south to Antarctica. 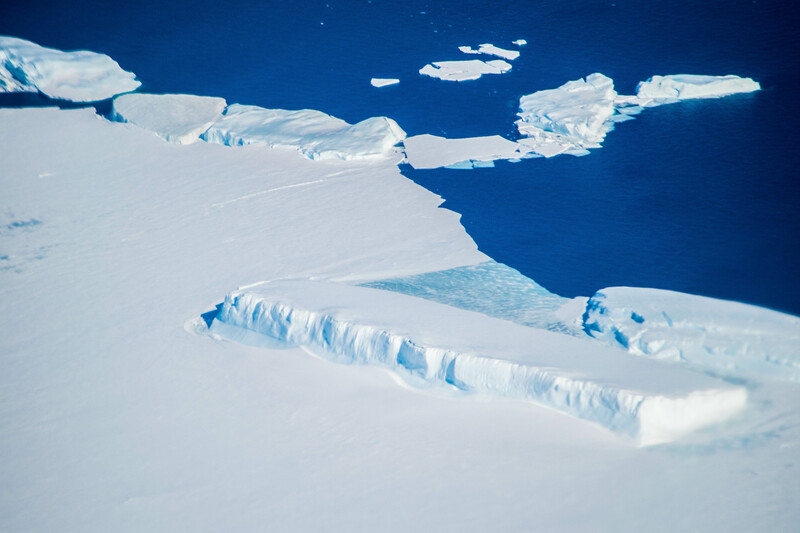 New icebergs forming on the edge of the ice continent. 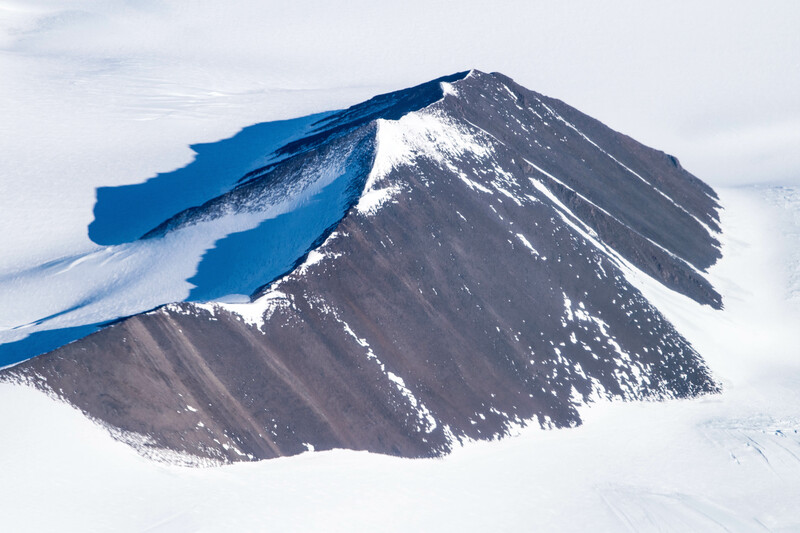 One of the many snow capped mountains of Antarctica. Only 2% of Antarctica is not covered in snow or ice. The lighter side of an Antarctic mountain. 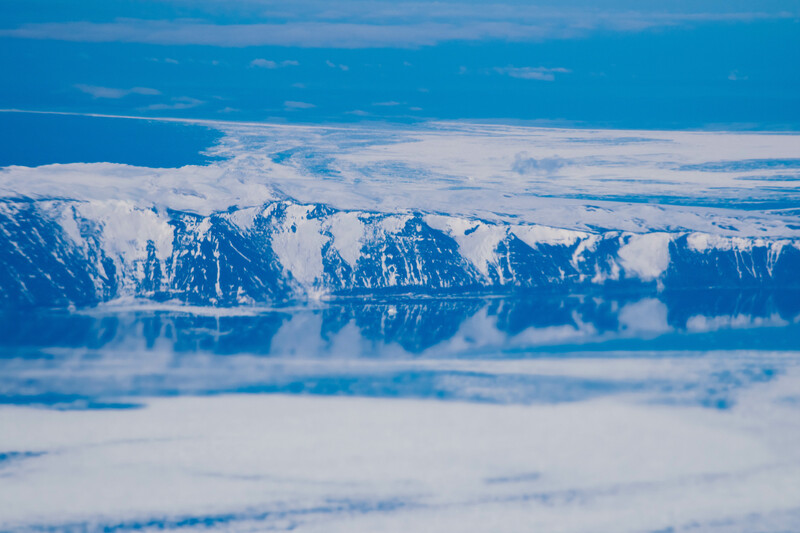 Antarctica mountain ranges stretching towards the horizon. 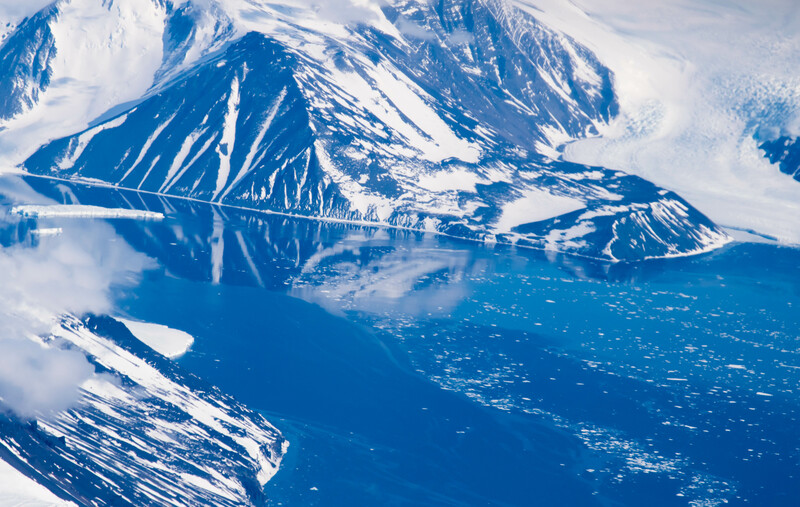 Mountain ranges stop abruptly, sinking to the deep blue waters of Antarctica. Reflections from the still sea water of an Antarctic inlet. Mountain ranges of Antarctica meet the deep blue sea. Icebergs can travel up to 100km (62miles) per day with the strong currents. Only 2% of Antarctica is not covered in snow or ice. 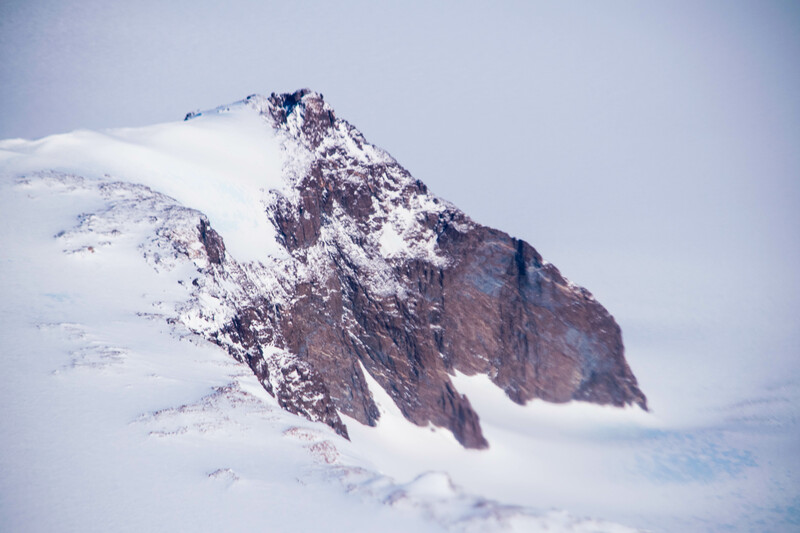 Highest mountain range in Antarctica soars just over 16,000 feet. 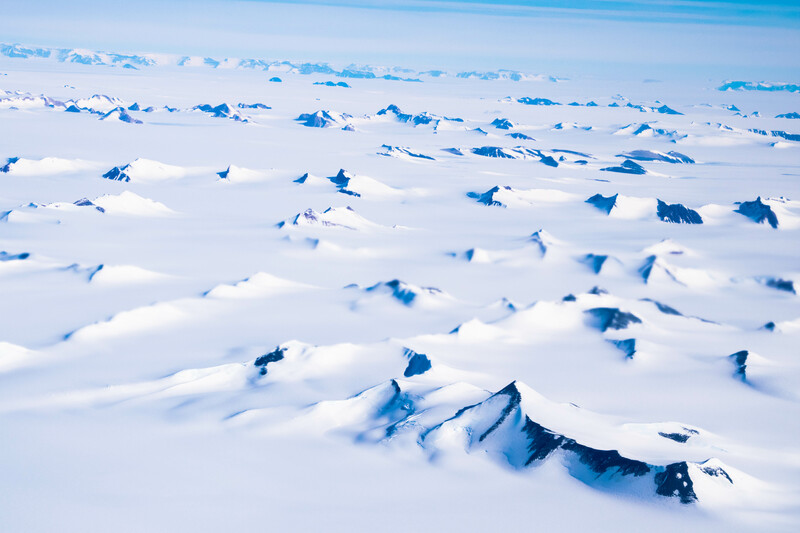 Antarctic mountains peering through the dense snow and ice. Antarctic mountain ranges meeting the ocean. 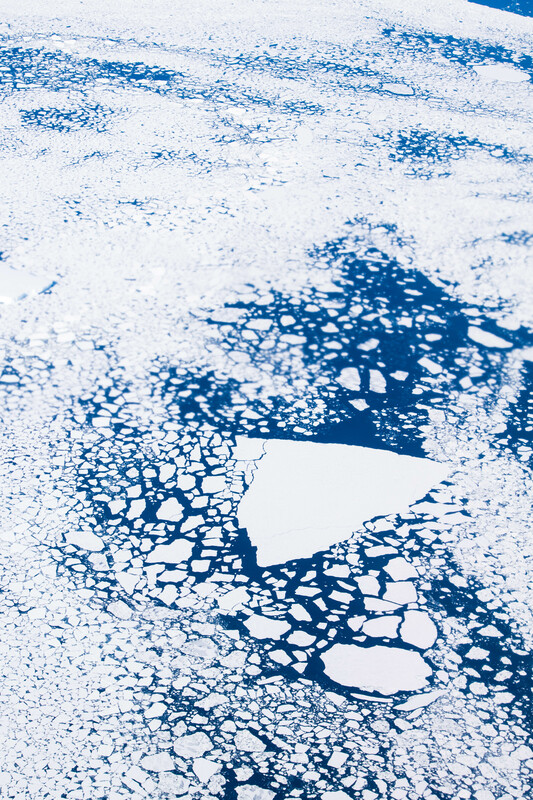 Swirls of sheet ice and icebergs are carried by strong currents. Huge sheets of ice break away during the summer months drifting for months over many hundreds of kilometres. Dramatic cliff tops along the coast line of Antarctica. 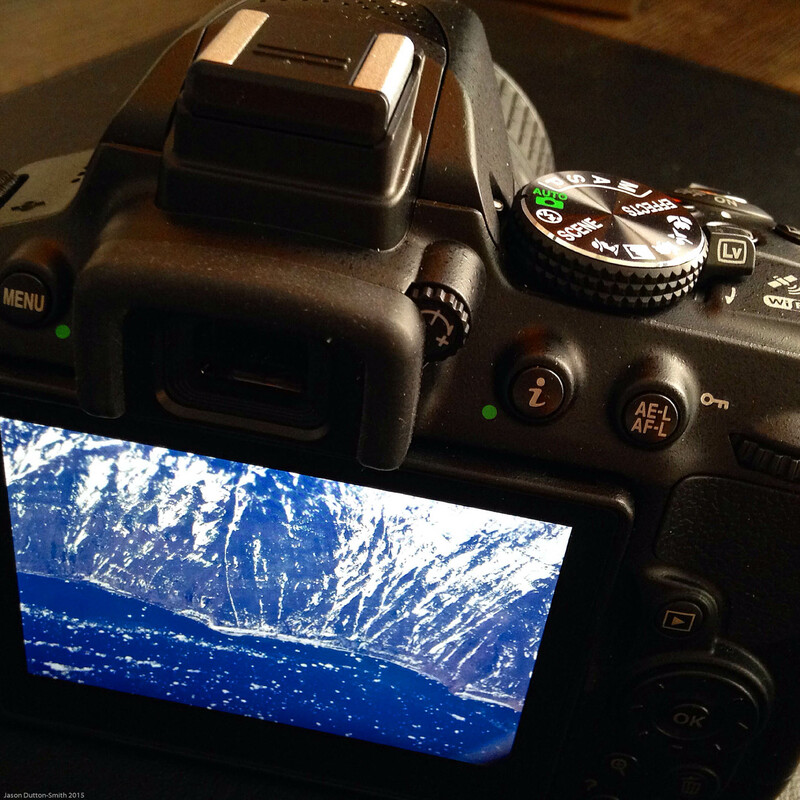 My new Nikon camera highlighting one of my favourite pictures of Antarctica. 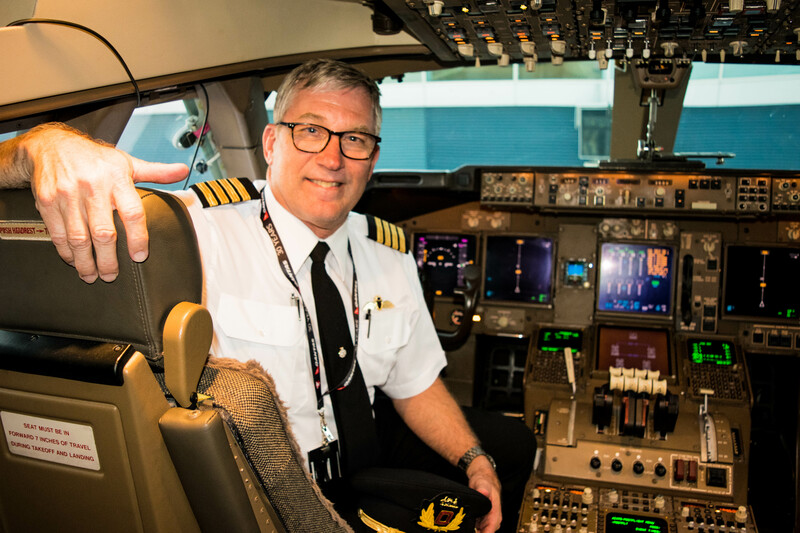 Qantas Captain Rob Meek safely directed us on our Antarctic journey. Looks like a really beautiful sight, but also mighty cold. I know exactly what you mean !!! 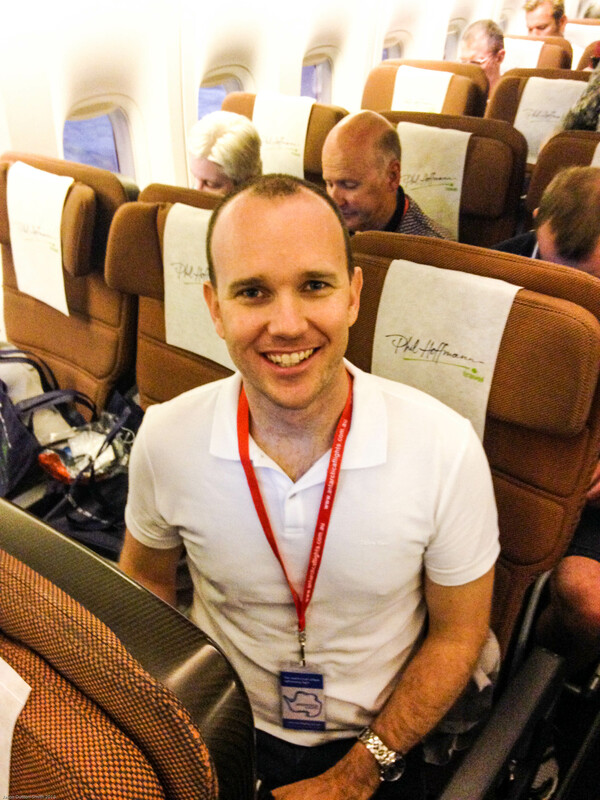 I did my second flight out of Sydney this past New Years Eve and of course loved it !!! It won’t be my last either and it’s the best adventure anyone can have in one day if you ask me. I’m also just home from my land and sea adventure down there. I have to say that really will have you awestruck. I travelled the South Georgia Region and then sailed down to and managed the Antarctic Circle Crossing on the very unique Russian ship called the Polar Pioneer. My life long dream come true. And it didn’t disappoint ! Enjoy what you do Jason. Thanks Oz, much appreciated! Glad you enjoyed the article. And what a fantastic sounding trip you did. I will be doing one of the adventure cruises without doubt. Thanks for your comment.